THE PRIZE: Another 2 for 1 and for those that maybe aren't so into make-up but like to look after themselves. Anatomicals Don't Just Clean It Woman Scrub It Body Scrub and Waitrose Baby Bottom Butter. (No I'm not insane, this is the nicest, post exfoliating moisturiser ever.) 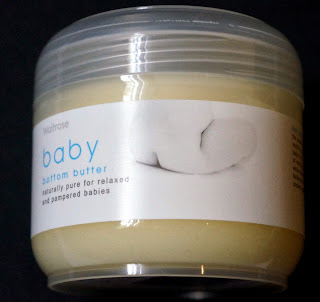 It is like butter and it will make your skin as smooth as a baby's. HOW TO ENTER: Leave me a comment under this post. Good luck! YESTERDAYS WINNER: Is Helen Gilbert - congratulations and please email me your postal address so I can post you the shower gel and lip glaze. Just what my skin needs at this time of year! Please plick me! My girlfriend would love this! I LOVE Anatomicals! Thanks for running. Fab prize, hope to win, this would sort out my dry skin problems!